This report presents the OECD’s assessment of recent developments in Israel in the area of labour market and social policy. It focuses on recent trends in poverty and employment outcomes and policy development to improve employment opportunities, especially for the Arab and Haredi communities. But the policy debate and recent labour market and social policy development in Israel were also affected by the wave of Israeli “middleclass” protests that took place in August-September 2011 against the lack of social justice and the high cost of living (especially for housing). Over the past two years, the Israeli government has rolled out many new initiatives to deal with poverty and social exclusion among the Arab and Haredi populations. There have been important employment gains among Arab women, and in particular the Haredi. It is unrealistic to expect that deeply entrenched inequalities in Israel can be overcome in only two years time, especially as they require a sustained effort across a broad range of policy areas. However, the scale of the Israeli policy responses to date appears small relative to the enormity of the task at hand, and further progress will depend on continued and expanded investment in effective anti-poverty measures. Israel has enjoyed strong economic growth over the last decade, but the benefits of this are being distributed unevenly. Poverty rates are higher than in any OECD country, which reflects the deep social and economic divides in Israeli society. On one side, there is the general Jewish population with poverty and employment rates similar to those of OECD countries. On the other, there are Arabs and ultra-Orthodox Jews, or Haredim, who have large families, poor educational outcomes and low employment rates. As a result, just over half of Arab and Haredi families live in poverty. Almost half of all children entering primary school in Israel come from one of these two groups, so profound policy changes are needed to prevent future generations of Arabs and Haredim from being scarred by the disadvantages these population groups face today. Tackling the root causes of such deep inequality would greatly enhance the dynamism of the Israeli economy. Greater investment to help workers improve their skills is urgently needed. Welfare-to-work programmes need to be restructured and extended, including by reducing child benefits paid to families who are able to work but do not and by sharply increasing the Earned Income Tax Credit to tackle in-work poverty more effectively. And access to means-tested income supports for the neediest should be improved. Israel has failed to enforce many aspects of its labour legislation, contributing to poor employment conditions for many resident, cross-border and foreign low-income workers. Rules to overcome discrimination against all workers need to be enforced, and Israel needs to be more active in stamping out illegal hiring and employment practices concerning temporary foreign workers. Progress has been made in many of these areas. New legislation and initiatives have been introduced. The challenge is how to make reform work in practice. The consequences of not doing so would be devastating. 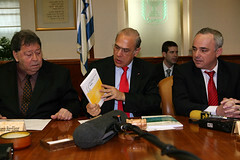 From left to right: Benyamin Ben-Eliezer, Minister for Industry, Trade and Labour, Israel; Angel Gurría OECD Secretary-General; Yuval Steinitz, Minister of Finance. Read the press release "press release"
(en français) Lire le communiqué de presse "Réformer l’enseignement et accroître l’emploi, deux enjeux clés pour la croissance économique d’Israël à long terme"
For accredited journalists: access the book using your password.